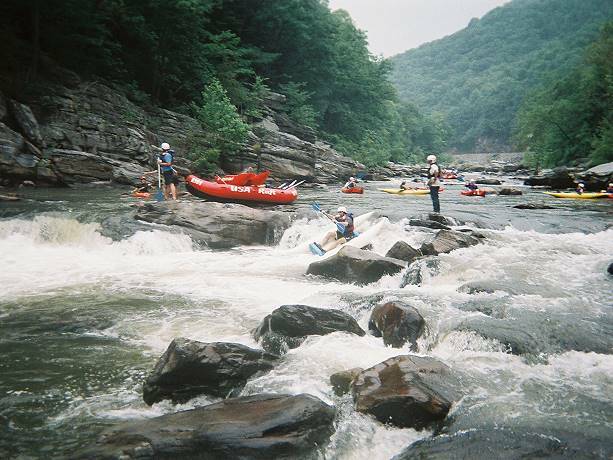 The Nolichucky Gorge is a popular destination for rafters and adventurous paddlers. We'll ride up with you in your vehicle to the put in at Poplar, NC and drive your vehicle back to the takeout (usually Chestoa) where it'll be waiting for you when you finish your trip. The trip down the river is approximately 8.5 miles long with most of the challenge at the beginning with class III and IV rapids and mellowing out to class II giving you time to sightsee. Warning: Once you begin, the only way out besides your boat is walking the railroad tracks back into town. Note that we aren't limited to Poplar - we'll ride with you wherever you want to put in and deliver your vehicle to your chosen takeout location. The cost for a Poplar - Chestoa shuttle with 1 vehicle is $20.00 and we're available 7 days a week. ​Call us at 423-330-7416 to schedule your boat shuttle. Also note that we require a signed waiver for whitewater, rafting, and kayaking shuttles.